Chrystal McCadden's son, Caden (shown above), was placed in handcuffs by a police officer who was dispatched to the school following a report that a student was a threat to himself and other students. 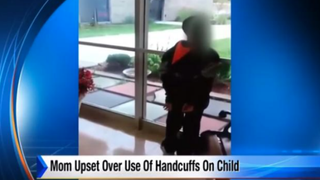 A 7-year-old Flint, Mich., boy with attention-deficit/hyperactivity disorder was at an after-school program Oct. 12 when his mother says she received a call telling her that her son was in handcuffs and that she needed to come pick him up. When Chrystal McCadden arrived at the Brownell STEM Academy, she demanded that the handcuffs be taken off her son, Caden. McCadden told WILX that the officer who placed the handcuffs on her son told her he didn't have the key to remove them. "'You put my son in handcuffs and you don't have the key?'" McCadden recounted to the news station. "What sense does that make?" Police say they received an urgent call from the after-school program reporting that there was a student who was a threat to other kids and possibly himself. "An officer was dispatched to Brownell STEM Academy in response to an urgent call for immediate assistance with a child who appeared intent on injuring himself, as well as repeatedly assaulting others," a police statement sent to the news station read. Flint Community Schools told the news station that it was working with the police to get to the bottom of exactly what took place at the after-school program. While it is unclear how the handcuffs were taken off Caden, McCadden is still furious that her little boy was ever handcuffed in the first place. "He don't deserve to be in no handcuffs," she told NBC 25 News. "He ain't in here with no knife. He ain't in here with no gun." Read more at WILX and NBC 25 News.